Sunday's confluence of parties is meant to signal that a united opposition will take on the BJP and its allies in the 2019 Lok Sabha election when Prime Minister Narendra Modi will seek a second term. 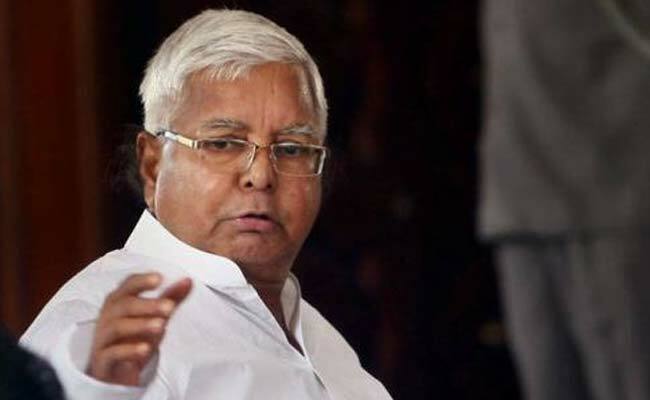 RJD chief Lalu Yadav is organising a mega rally in Patna on Sunday. Patna: Lalu Yadav's Patna rally on Sunday is drawing an opposition A-list, but Bahujan Samaj Pary chief Mayawati may choose to send a senior party leader instead of attending herself, with arch rival Akhilesh Yadav of the Samajwadi Party confirming he will be on stage. West Bengal Chief Minister Mamata Banerjee of the Trinamool Congress clearly does not have the same misgiving and will share stage with her rivals, top leaders of the Left. The Nationalist Congress Party (NCP), which has recently seemed unsure of a commitment to an opposition bloc to challenge the BJP, will also attend Lalu Yadav's rally in the Bihar capital it has said, though party chief Sharad Pawar is unwell and is unlikely be there. Sunday's confluence of 10 to 12 parties is meant to signal that a united opposition will take on the BJP and its allies in the 2019 Lok Sabha election when Prime Minister Narendra Modi will seek a second term. The NCP had recently skipped an opposition meeting chaired by Congress president Sonia Gandhi amid speculation that Mr Pawar's party failed to rescue senior Congress leader Ahmed Patel as he struggled to get elected to the Rajya Sabha or upper house of Parliament. He scraped through instead with the help of a single vote that is believed to have been cast in favour by Gujarat's lone Janata Dal United legislators Chottubhai Vasava. Top leaders of the NCP, including Sharad Pawar, have stoutly denied allegations that the party is leaning towards the BJP and sent senior leader Tariq Anwar to an opposition meeting in Delhi on Saturday. Congress vice president Rahul Gandhi, who is expected to lead his party at Lalu Yadav's rally, pitched a united opposition at Saturday's meeting, hosted by Sharad Yadav of the Janata Dal United, who has rebelled against his party boss and Bihar Chief Minister Nitish Kumar for deciding to dump Lalu Yadav and the Congress to set up a new government in the state in partnership with the BJP. While Nitish Kumar has publicly requested Sharad Yadav not to attend the Lalu rally, sources have said he actually wants his rebellious colleague to attend, so that he can be charged with anti-party activities. That will mean he can be removed from the JDU and will also have to give up his membership of the Rajya Sabha. Lalu Yadav's rally to attack PM Modi and the BJP was announced several months ago, before opposition unity was severely dented by the exit of Nitish Kumar. His defection has not only meant a weakened opposition but also that his former partners Lalu Yadav and the Congress have lost ruling party status in Bihar.